I've had a lot of fun working on my sites and I'm gonna be just a bit vain here and post the awards that I've been presented with. Recently we enjoyed a very pleasant visit to your web site! Each category may receive a score of between 1 to 10. Up to three V.V.C. members may score a particular website. The scores from each V.V.C. member are totaled (30 being a perfect score). These scores are than added together and averaged for a final score. Winning the award requires a total score of between 24 to 30. "The benefits of winning are simple. Only the best sites are voted to receive the Golden Web Award. The criterion for winning remains a challenge to even the best Webmaster, artists and designers. That being said, the primary benefit of the Golden Web Award is the recognition of your commitment to the pursuit of website excellence. Further, it represents that your work is considered an outstanding website, incorporating high standards of design, originality and content. Most importantly, the Golden Web Award lets others know you're viewed as a respected professional by your peers, one who is deserving of recognition." The next Golden Web Awards Ceremony, was slated to be held in Las Vegas, Nevada, April 2003. However, due to the recent tragedies, the event will be temporarily delayed until safety and public opinion are favorable for traveling. The future event, of which all award winners be notified, will include Special Awards, Features And other Member Presentations. "Recently we enjoyed a very pleasant visit to your web site! It is with great pride that we announce that your web site is a WINNER of our esteemed Majon Web Select "SEAL OF EXCELLENCE AWARD" "
"Congratulations you won the Top Site Award. This award is given to outstanding Web Pages and recognizes the hard work that was put into the development of your web site. Your score was as a 90 out of 100. A panel of two decided the final results. Thanks for helping make the Web a more interesting, fun and attractive place to visit. My compliments on a job well done!" "Your web-site has been reviewed, excellent graphics and layout. 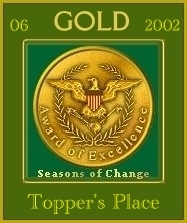 of Change Gold Award for June 2002.
place. It is evident that you have put a lot of hard work into your web space. This award is not automatic. All sites are viewed . 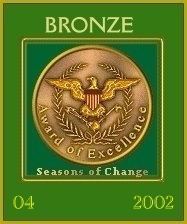 are chosen to receive this award each month. I was very impressed by your web site." you with the KYBearcub's Certificate Award. Congrats. "Your website has been accepted and we find it to be very beneficial for the internet community and is now posted for all to see." 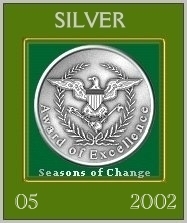 Eligibility Requirements: To qualify for this award all websites must be updated on a regular basis so that all links are in working order, and the website should be of original design and not someone else's work, the website must provide factual information about its products or services or be a quality reference site where people can go to get factual information. The main website page must load in 45 seconds or less, because people find it an inconvenience to wait any longer. At least one of your web pages must contain links to other websites on the internet that are not your own, this way your site is truly a web resource and not a dead end point.